If you haven’t done a caterpillar to butterfly unit and raised the little buggers, you are missing out. For me, the Lifecycle of a Caterpillar Butterfly unit was always a good time. Right after spring break I like to come back to something fun! Live Butterfly Kit -: shipped with 5 Painted Lady Caterpillars that I purchased a few years back. Each year since my initial purchase, I have just purchase the 5 Live Caterpillars Kit Refill . Always a hit and I love doing this as much as the kids! Link to Post. 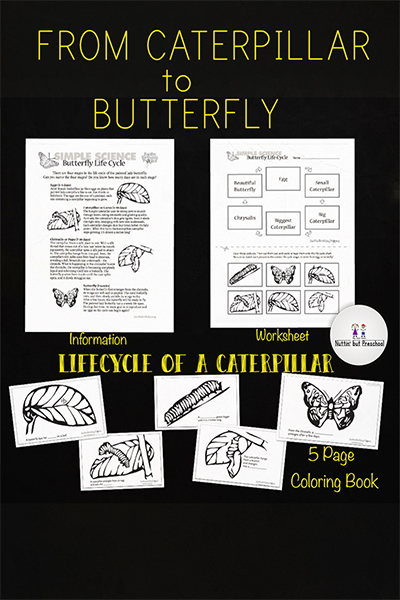 5-page printable coloring book outlining the lifecycle from caterpillar to butterfly. PDF file. An information sheet explaining the four stages in the life cycle of the painted lady butterfly and a worksheet with the stages to cut and glue in the proper order. Can you name the four stages? Do you know how many days are in each stage? Get the PDF file and find the answers here: HERE.